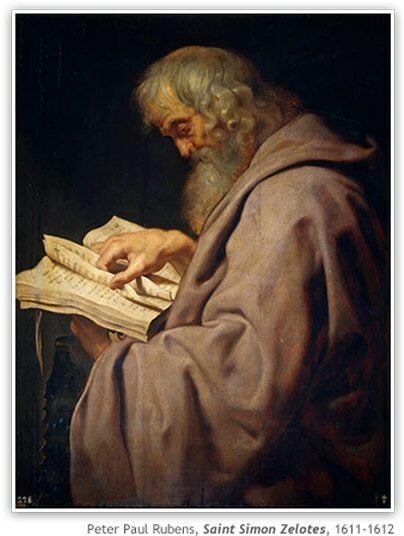 St. Simon is surnamed the Zealot, to distinguish him from St. Peter, and from St. Simeon, the brother of St. James the Less. In some versions of the scripture, he is referred to as Simon the Cananaean, Simon the Canaanite or Simon the Canaanite. St. Simon is often associated with St. Jude as an evangelizing team. The most widespread tradition is that after evangelizing in Egypt, St. Simon joined St. Jude in Persia and Armenia, where both were martyred in 65 AD. St. Simon was twenty-eight years old when he was called to be an apostle. St. Simon continued in communion with the rest of the apostles and disciples at Jerusalem, and at the feast of Pentecost received the same miraculous gifts of the Holy Spirit. Bible scholars argue over whether Simon was a member of the radical Zealot party or whether the term simply referred to his religious zeal. Those who take the former view think Jesus may have chosen Simon, a member of the tax-hating, Roman-hating Zealots, to counterbalance Matthew, a former tax collector and employee of the Roman Empire. Those scholars say such a move by Jesus would have shown that his kingdom reaches out to people in all walks of life. Simon's strength was his inspirational loyalty and his great weakness was his material-mindedness. The one thing about Jesus that Simon admired so much was His calmness, assurance, poise, and inexplicable composure. In art, Simon has the identifying attribute of a saw because according to Western Christianity, he was martyred by being sawed in half. Eastern Christianity tradition differs from Western Christianity tradition in the telling of the death of St. Simon. According to St. Basil the Great, the 4th-century Cappadocian Father, Simon died peacefully at Edessa. In the Western Church Simon is venerated together with St. Jude Thaddaeus. The Western Church keeps his feast on October 28th; the Greeks and Copts on May 10th.